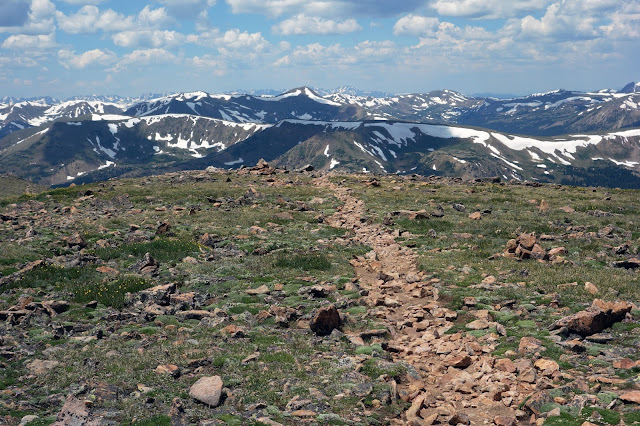 My friend Leslie is spending the summer hiking the Continental Divide Trail — 3,100 miles of rugged and remote high country from Mexico to Canada. 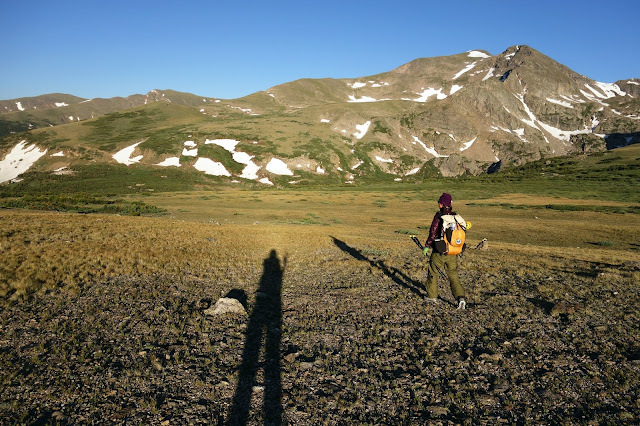 She started May 22 at the Mexican border and hiked across New Mexico to Chama, where she encountered a wall of snowy peaks in Colorado's San Juan Mountains. Her husband, Keith, is loosely following her in his camper-truck while road-tripping around the West, so he drove her up to the base of the Wind Rivers in Wyoming so she could start hiking south across the Great Divide Basin and Colorado. 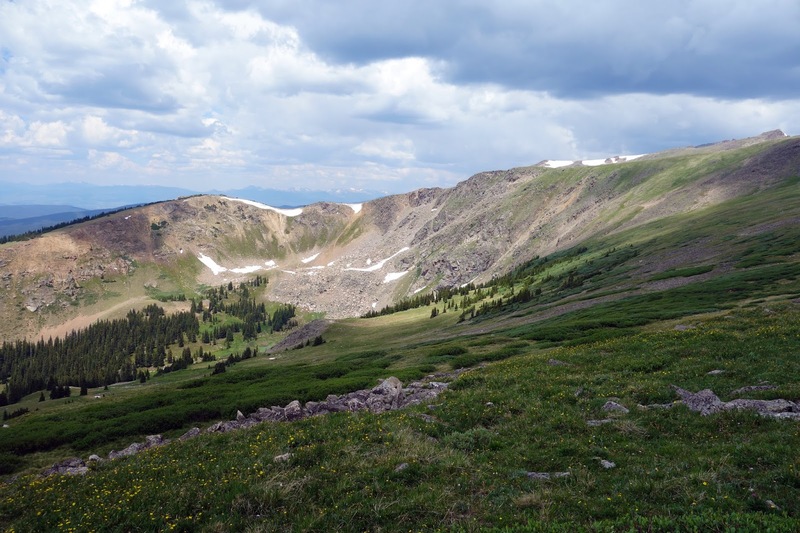 When she reaches Chama, she'll flip north again in hopes of completing the thru-hike in one summer. Keith dropped by to visit Beat and me in Boulder last week, and offered to provide a shuttle so I could join Leslie on my "local" segment of the CDT — 60 miles between Grand Lake and Berthoud Pass. Leslie generally walks between 25 and 35 miles a day, although her average had dropped a bit since she started into Colorado. I understood that she'd budgeted two and a half days for this segment, and I also understood how difficult it could be from the pieces I'd walked. After all, it took me seven hours to day-hike 14 miles to James Peak just two weeks ago. Would I be able to manage my exertion and breathing enough to keep up with Leslie's demanding thru-hiker pace? I was genuinely more nervous about the prospect of this weekend backpacking trip than I was about starting the Bryce 100 last month. On Thursday afternoon I met Keith at Berthoud Pass and we drove to Grand Lake, where Keith had booked three beds at the hostel. After scouring my memories, I believe this was my first hostel dorm room stay, ever. I've always been a bit averse to communal sleeping, and I'd generally rather curl up in a bivy sack in the woods than share a bunk bed in a hot room full of strangers. But it was a welcome respite for Leslie after days in the dusty mountains. And the Grand Lake hostel is quite nice — stunning location on cliffs above a rushing creek, and rather upscale amenities for $25 a night. Keith and I were even treated to a ranger chat about Rocky Mountain National Park while we waited for Leslie to arrive. Leslie slept in until the "hiker noon" hour of 7 a.m., and then cooked breakfast for Keith and me. She forgot to charge her phone, which was our main navigation device with the official route, water locations, and notes. (She also had maps, and I had a GPS, but we still managed to get lost several times.) 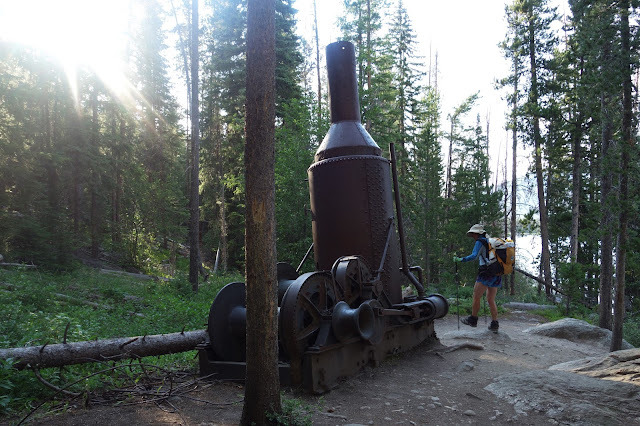 While we waited for it to charge, Leslie packed and repacked her backpack while I paced and nervously pretended to read the history lessons that had been framed and hung on the walls. Finally we set out after 10 a.m., strolling along the shoreline of Shadow Mountain Lake and waving at weekend boaters. This trip was also my first real exposure to thru-hiking, which isn't unlike multi-day endurance racing. 3,100 miles is a lot of distance to cover in the short weather window between snowmelt and snowfall, and time pressure is always there. Thru-hiking is either mostly or entirely self-supported, so self-care, navigating, and resupplying can demand as much energy as walking. Leslie typically hikes from sunrise to sunset, only stopping briefly to take in a view or filter water from a stream. She eats on the go. She doesn't cook — stale bagels and tortillas with sweaty cheese slices are her "real" food. She drinks cold instant coffee from an empty peanut butter jar, also as she's walking. Since she started six weeks ago, she's only taken two "zero days," or days off. My longest endurance racing effort was 24 days; Leslie is aiming for four months of this lifestyle. 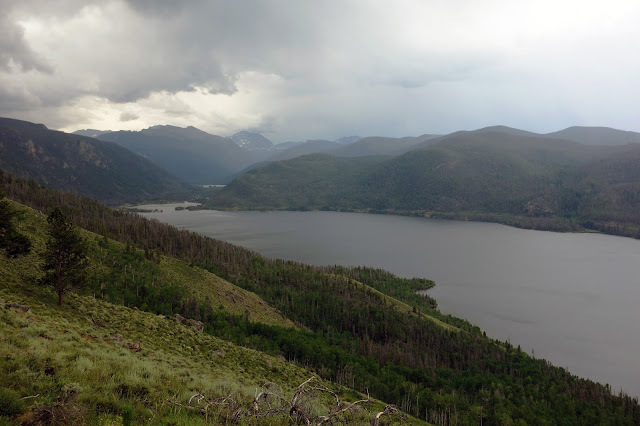 I tried to wrap my head around this as we crawled over endless deadfall tangles, muddy bogs, and sagebrush-covered hills along Lake Granby. 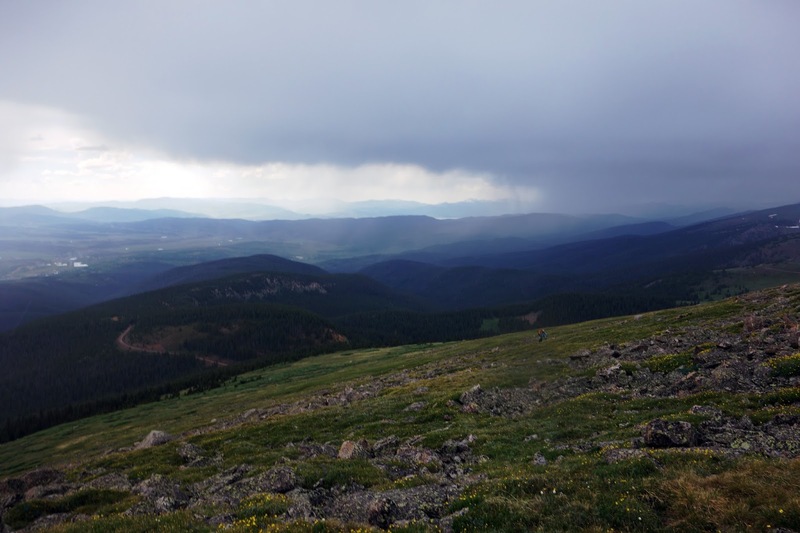 Storms moved in during the afternoon, and wind and rain pummeled us on the sagebrush slopes. Leslie threw on a poncho, which seemed like a smart piece of gear, good for multiple purposes (note to self.) I was grateful for a respite from the heat, although it was still warm and now muggy. Monsoon season is here. This will likely happen every day until the end of July, so tomorrow would be the same. Thoughts of this weather in the high country made me uneasy. 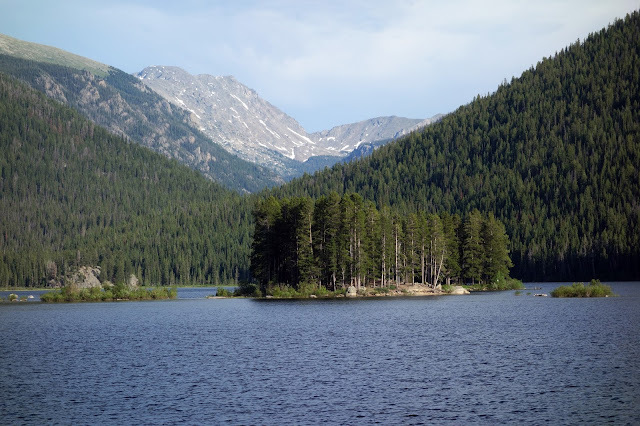 It was a pleasant evening on Monarch Lake as we marched toward North and South Arapahoe peaks. I pointed out the mountain top where I stood with my dad and Beat the weekend prior, and Leslie said "really?" with genuine disbelief. 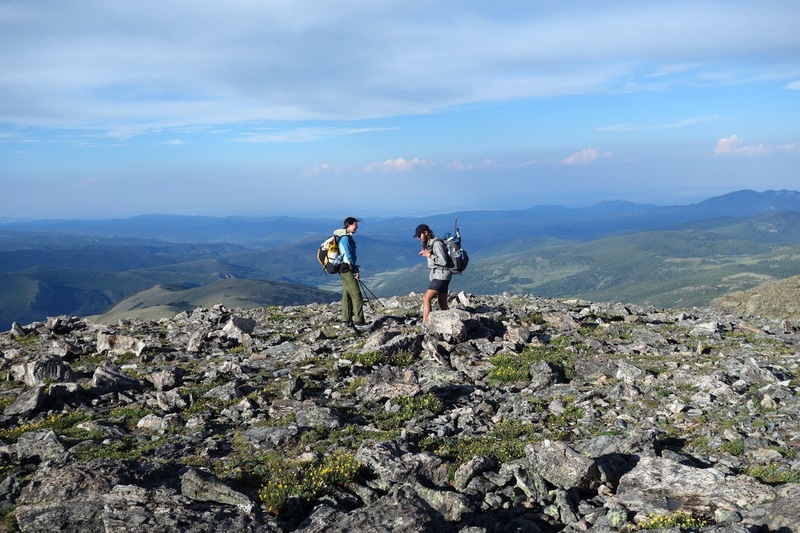 Thru-hiking is such an encompassing lifestyle that it becomes difficult to imagine a world outside that narrow strip of trail. Every time we saw day hikers, Leslie would wonder aloud, "Where did they come from?" — as though they had to walk hundreds of miles to reach this spot as well. Exploring old mining equipment beside Monarch Lake. Leslie also understood that most other people couldn't begin to wrap their heads around what she was doing. 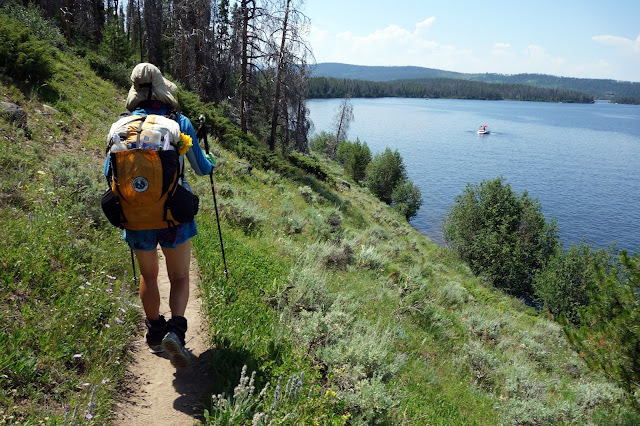 Even as she stopped to chat with nearly everyone we passed, she rarely belabored the 3,100-mile hike. We were about a half mile past the Monarch Lake trailhead when we passed two older women gently stepping over a tiny stream. "Are you two going to sleep out tonight?" one exclaimed. After a simple "yes," she said with even more enthusiasm, "Good for you!" In three short days, we encountered almost 30 northbound CDT hikers, largely in a bubble of folks who left in early May and picked their way through the snowy San Juans. Most were ragged from the experience, talking about grueling eight-mile days and fearing for their lives on steep slopes — a danger of which I have no doubt. Leslie feels no regret about her decision to flip. She's in this for pleasure and joy, not purist sentiments. My mentality would probably fall more in line with a continuous thru-hike if I were to ever attempt something like this — but I'm also a cautious person. 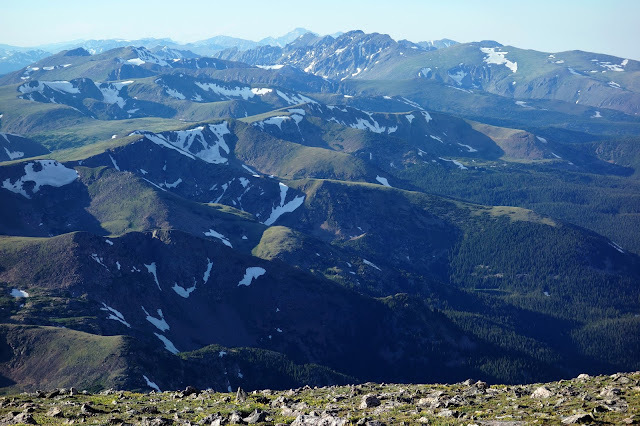 Would I have taken on the snowy San Juans by myself, with an ice ax, crampons, and my fear of spring avalanche conditions? Probably not. Another aspect of thru-hiking culture that I was introduced to on this trip is trail names. Every thru-hiker takes on a trail name that they use to introduce themselves to other thru-hikers or sign into trail registers. The names are bestowed by fellow thru-hikers, generally early in the hike and based on an experience or aspect of one's personality. Leslie's trail name is "Tour Guide," which was apt as she guided me on my little CDT weekend. I used to think people could choose their own trail names and even had one picked out if I ever did a thru-hike, but I've learned that naming oneself is not cool. I'm not sure I'm interested in taking on a name made up by a relative stranger. I mean, I already didn't get to pick Jill ... not that I hate Jill. But I might just stick with Jill if I ever do something like this. I'm a contrarian like that. One example of the perils of trail names is our interaction with a nice, conservative-seeming 40-something couple from Mississippi. Thru-hikers were always asking whether we'd seen others who might have been ahead or behind them. Several had asked us about a hiker called "Moist." After I ranted about the reasons why moist is the worst word in the English language, Leslie still greeted this woman with the question, "Are you, um, Moist?" The look on the woman's face was priceless — a mixture of curiosity and horror. I had the best laugh I've had in a while. 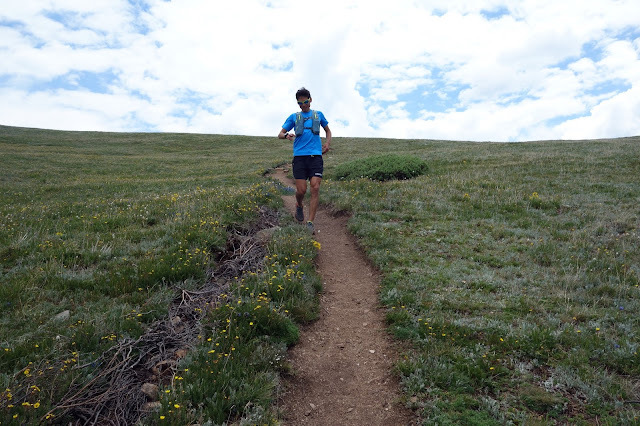 On Saturday morning, we encountered Sage Canaday running on the High Lonesome Trail. Sage is an ultrarunning star — apparently local to Boulder. He stopped and talked to Leslie for several minutes before scampering up the steep trail at stunning speed. I took this photo as he pranced downhill like a weightless gazelle. Like clockwork, dark clouds began to gather overhead in the late morning. As a Colorado day hiker, I would look at this weather and think, "Oh well, not today," and turn around. Thru-hikers don't give themselves that luxury. They still have to make decisions based on safety, but they don't have the time to sit out every storm. I knew the High Lonesome Trail led to at least ten miles of exposed ridge walking, at altitudes where I've proven to be quite slow. We looked over our shoulders for evidence of lightning as we nervously climbed higher. Several cloudbursts just missed us, carrying their damaging wind and hail eastward toward the plains. Meanwhile, my exertion levels ramped up too quickly, and I had to concentrate on my breathing and heart rate — I actually brought a heart rate monitor and two watches on this trip so I could pace myself. The urge to sprint off this ridge was strong, but I doubt I would have been physically capable of much more than I was doing. As I explained to Leslie, "I can still move forward almost indefinitely, but my ceiling these days is low." 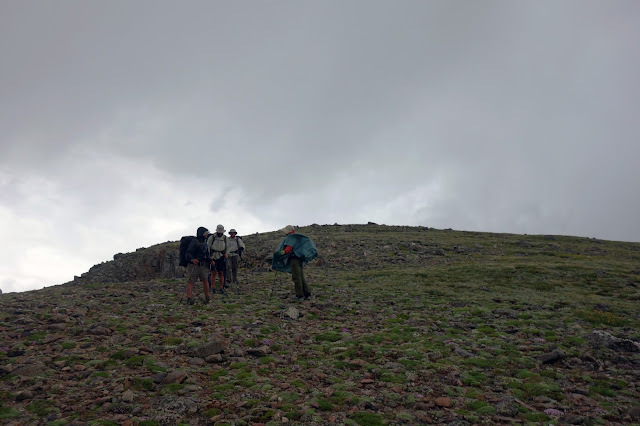 Between Rollins Pass and Rogers Pass were three miles of overland travel across the tundra — it reminded me of stumbling over the rocks and tussocks of Iceland, and also that I haven't done much of this type of walking since. It's a bad place for Hokas, but at least my ankles are used to this by now. Travel was slow, but it brought my exertion levels down, which made me happy. If only these storms would go away. 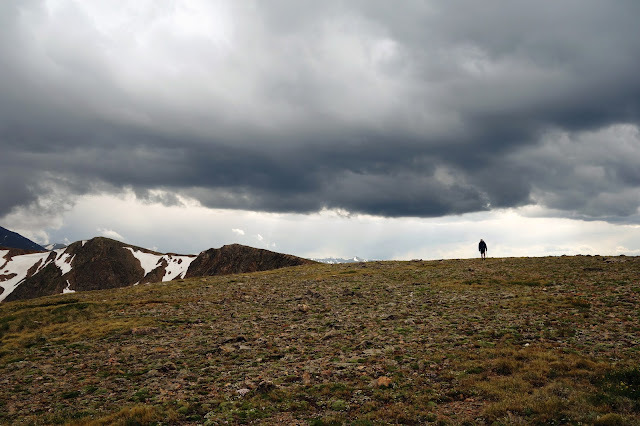 Another thru-hiker approaching with the storm. 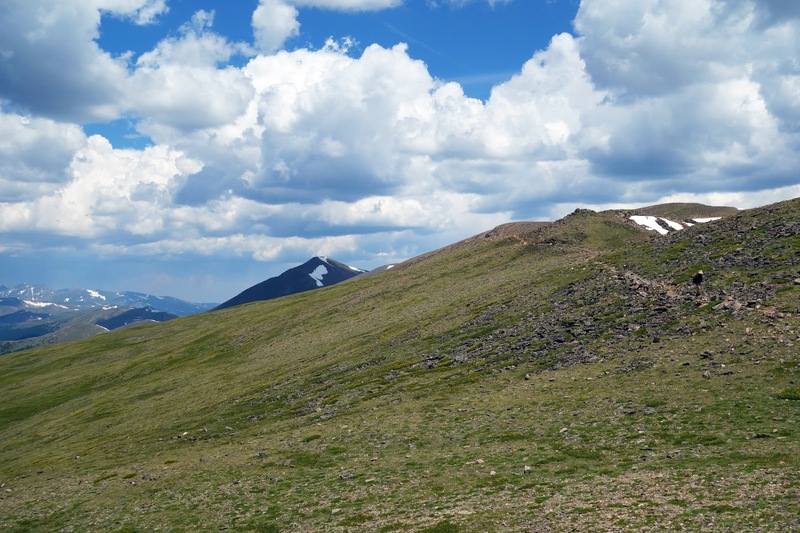 Our objective, James Peak (left) was still impossibly far in the distance. Finally, a storm hit us directly, with a gale of wind and rain that was surprisingly frigid. 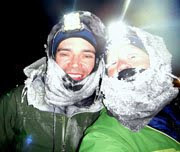 Here it was, 95 degrees in Boulder, and we were as bundled up as we could be at 12,000 feet. Leslie kept drifting off the ridge, understandably — I wanted to be lower, too. But sticking close to literal Continental Divide was the only way to reach Rogers Pass, our next opportunity for escape. 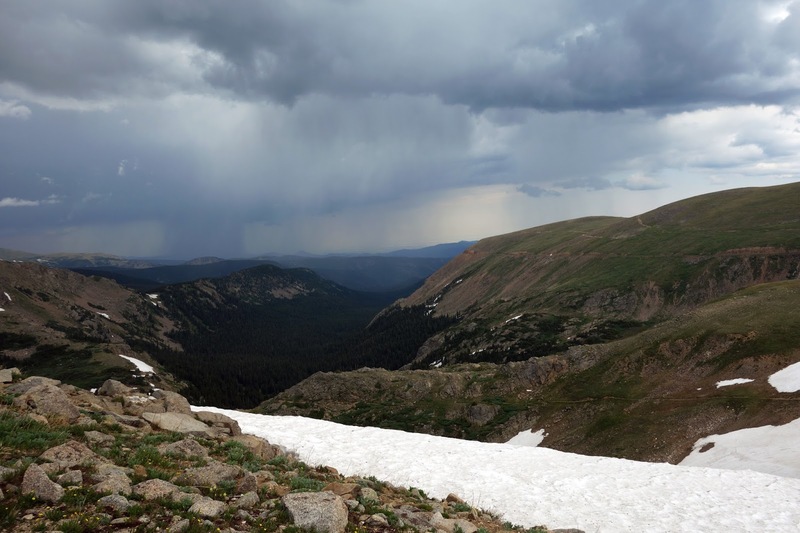 As the storm began to dissipate, we encountered yet more thru-hikers on the ridge. Of course everyone still stopped to chat. These guys seemed to have not a care in the world. For hours I had been plotting our off-route escape down Rogers Pass, but when we arrived at 5 p.m., skies overhead were beginning to clear. The storms appeared to be retreating for the night, but we couldn't be sure. 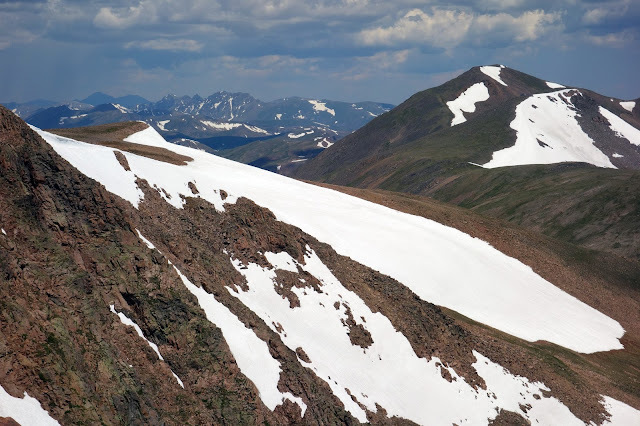 As we looked up at the broad summit of James Peak, I warned Leslie, "It's only two miles, but two weeks ago that stretch took me 90 minutes. I'm not exaggerating. It will probably be three hours before we're off that peak." "Should we go for it?" "Yeah, let's go for it." Working our way up to 13,300 feet as the sun came out at its evening angle, casting gorgeous light across the slopes. I struggled with the climb, but it wasn't bad. For the most part I kept up with Leslie, and made better time than I did with a significantly lighter pack two weeks ago. From James Peak, looking out toward Mount Bancroft and Parry Peak. 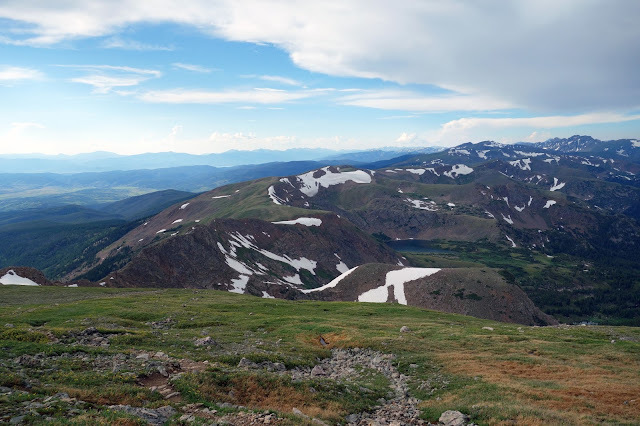 As a rugged CDT alternative, one can actually follow the true Divide over five 13-ers before dropping down to Berthoud Pass. The scrambling looked intimidating but possibly doable — but not with the limited water we had, and not starting at 7 p.m. 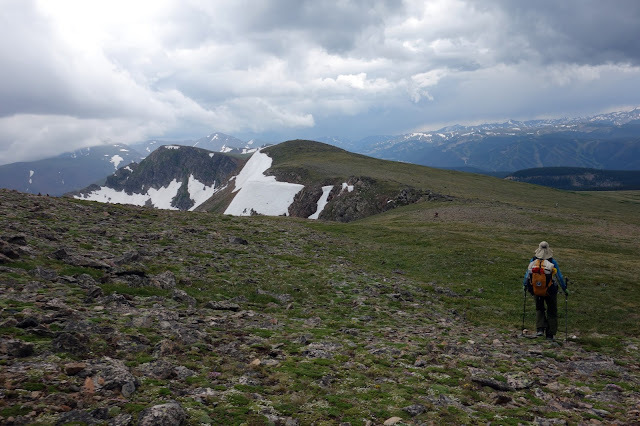 Neither of us were interested in camping on rocky tundra at 13,000 feet and melting snow for drinking water, so we'd have to save this ridge walk for another day. We continued to meet a stream of hikers on the peak at 7 p.m., heading for a night in the high country. 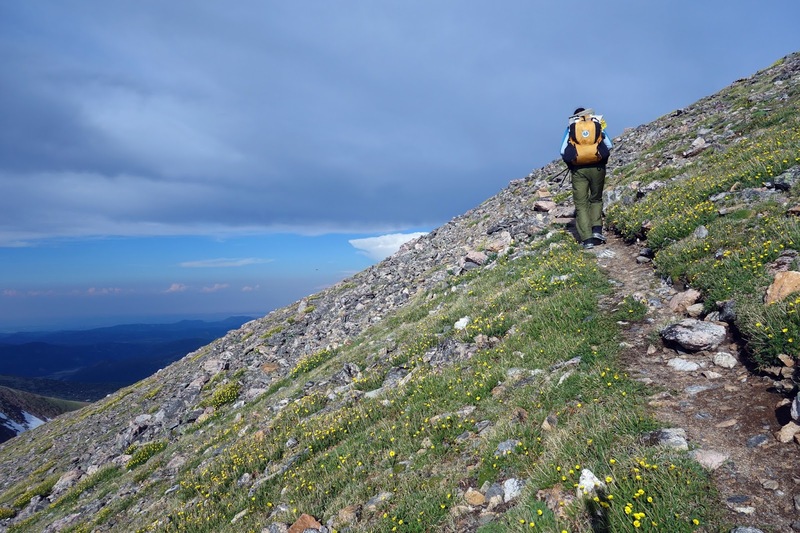 Probably the better time of day to tackle these altitudes during monsoon season. 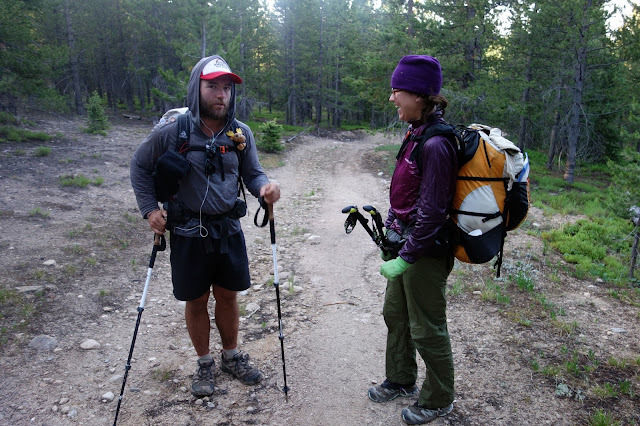 Leslie always engaged in long talks with the hikers — not only to collect beta about the trail, but also to probe the secrets of their personal motivations. 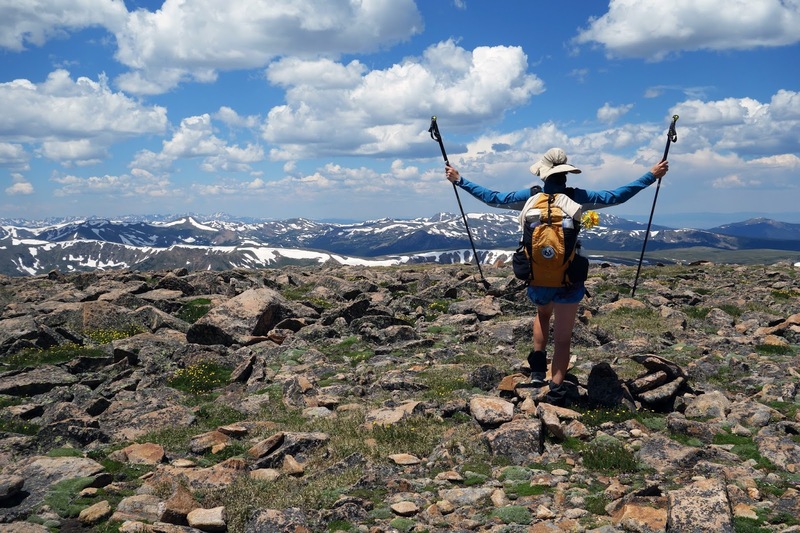 Thru-hikers are all so different, as are the reasons why they're out there. We met a man in his 40s with four kids and a wife at home, living out his dream. We met dude-bros with beards and tattered clothing. We met a 41-year-old Asian man with bulging biceps and a prominent gut who had hiked more than 30,000 miles since he started thru-hiking at 20. We met a grumpy Brit and an Israeli man with perfect flowing curls (honestly, it looked like he washed and styled his hair minutes before we met.) 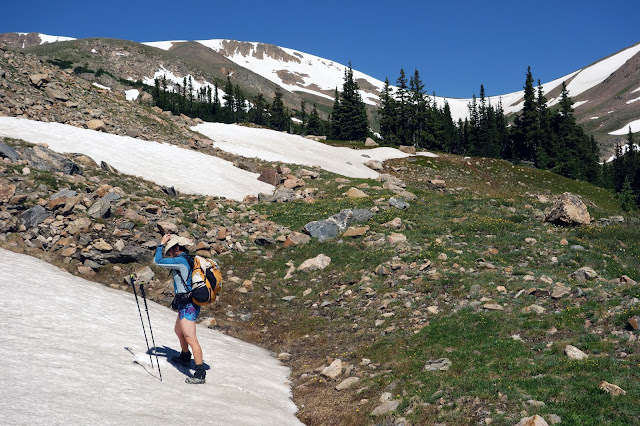 We met perky young women with male companions, and a 62-year-old woman lamenting her slowness while hiking 25 miles a day. Thru-hikers are a diverse and fascinating sub-culture of humans. Looking toward the ridge we hiked under cloud cover during the day. 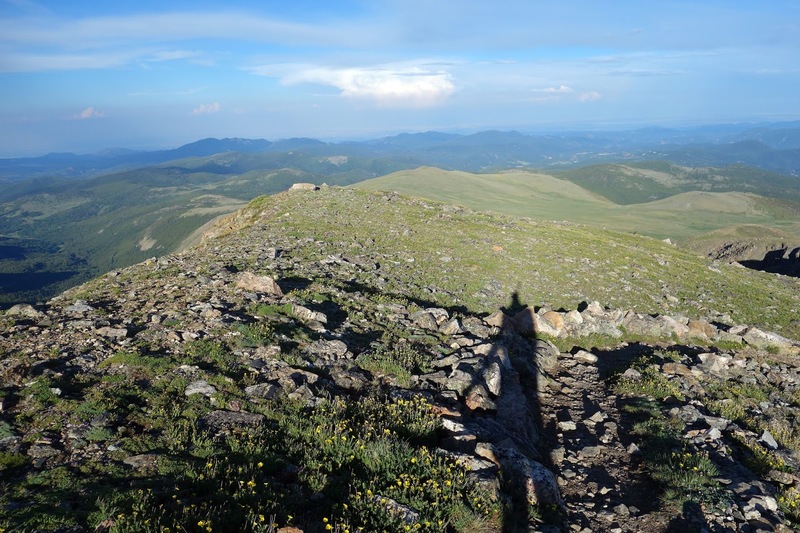 I was so thrilled to stand on the summit of a 13,000-foot peak at this time of evening, surrounded by a depth of silence and light. 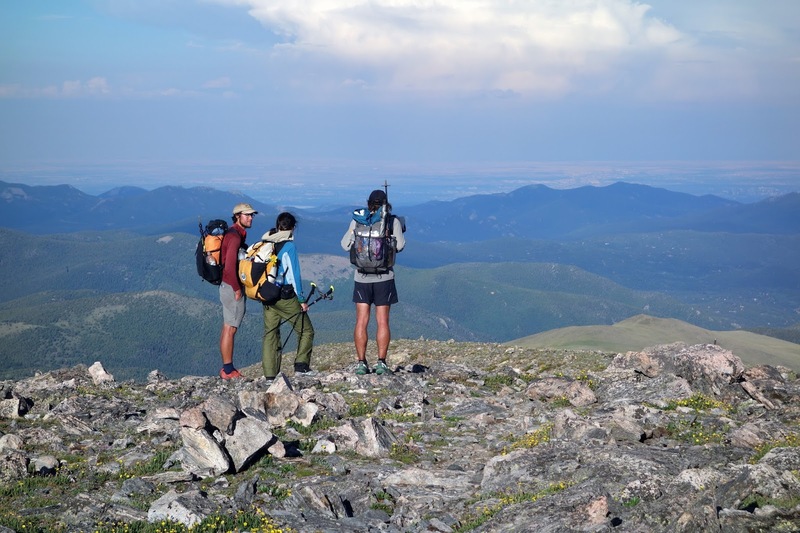 More thru-hikers, sharing beta as they gazed toward plains. One pointed toward a glistening island of buildings to the southeast and wondered with disbelief, "Is that Denver?" To Leslie I pointed out Bear and South Boulder peaks. "Just below that is where I live." It all looks so diminutive from up here. Working our way down the backside of James. The last of the sunlight we'd see for the day. A nearly full moon was rising to the east. Like flipping a light switch, the temperature instantly plummeted. Mittens, hats, and jackets came back on. We set up camp at 11,500 feet on the tundra. Leslie had wanted to drop below treeline, but I was glad we settled for this spot. The moon rose over the pink horizon, and alpenglow illuminated 14-ers to the south. I took a bunch of blurry photos that aren't worth sharing, but the views were stunning. It was also chilly — there was a hard frost overnight — for which Leslie was less than thrilled. But I was perfectly in my element. And I had time to sit down and cook a meal of Chili Mac with a packet of oatmeal for dessert. Somewhat stupidly, I brought a stove and quite a few of my calories in dried meals and powder for hot drinks, not quite understanding that there would be few opportunities to fire up the stove. It was pack up and go in the morning, then set up and collapse at a dry camp in the evening. 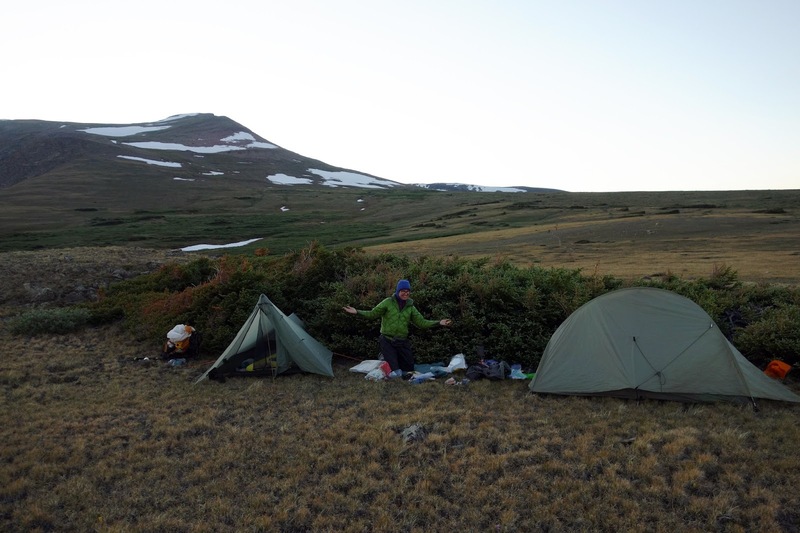 The following morning, I boiled water for coffee as I took down my tent, then drank it while I stumbled through my morning stupor down the rocky trail to 10,000 feet. Was carrying the stove worth it? Yes. After the long descent it was instantly time to climb (and then drop again, and then climb again) back to alpine country. Welcome to Colorado. 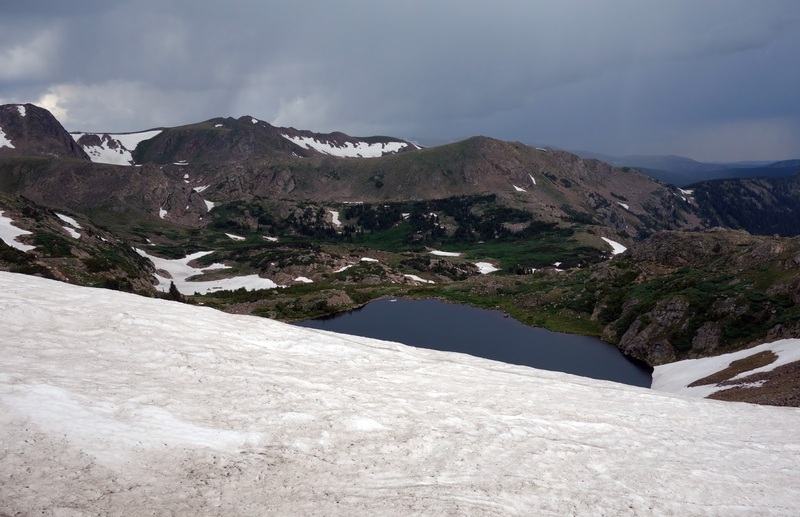 While traversing across snowfields above the Mill Creek valley, we lost the trail and ventured too far and too low, forcing us to crawl through mushy bogs to the ridge. 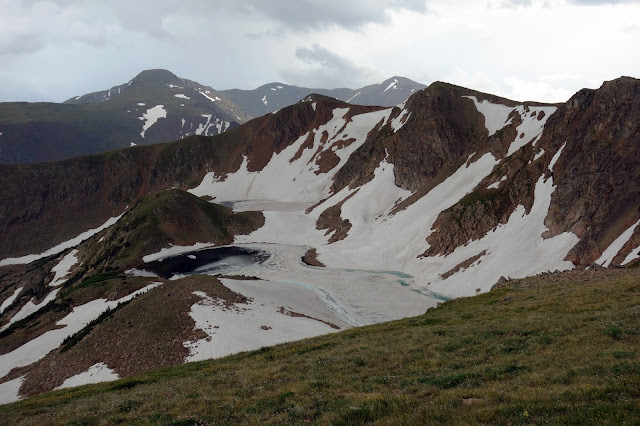 We wasted time trying to skirt around the steep, snow-covered slope before finally deciding the only way to continue was scrambling directly skyward. It was a tough hour or so, and I started to feel dizzy from over-exertion. 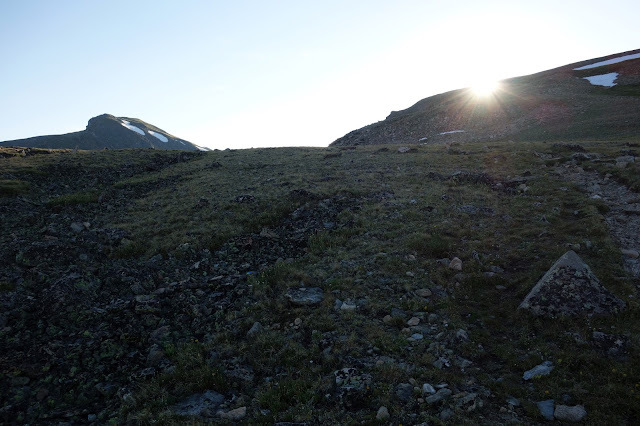 We finally found the trail, a relative super-highway compared to the scrambling we were doing, but still just a cairn-guided route through the boulder field. As soon as my heart rate went down I felt markedly better. This had been a beautiful and fun trip with my friend, but also usefully revealing in where my limits stand. They're not great. Frustrating to me still. But if they allow me to hike 60 miles through the rugged wilderness in a weekend, I can't complain. Leslie on top of Mount Flora, 13,100 feet. Keith met us below the summit and hiked back to Berthoud Pass. Thanks to my respiratory limitations, I don't tire the rest of myself that much. My legs felt fresh and my feet didn't hurt. Even my shoulders and back, not used to carrying a weekend load, felt only mildly sore. From this perspective I could almost imagine myself in the life of a thru-hiker. Everyone I met looked tired but strong, gaining fitness every day. But they still have a long, long way to go. Thanks for the great weekend, Tour Guide. I hope we can do it again, sooner than later. I'm so jealous! 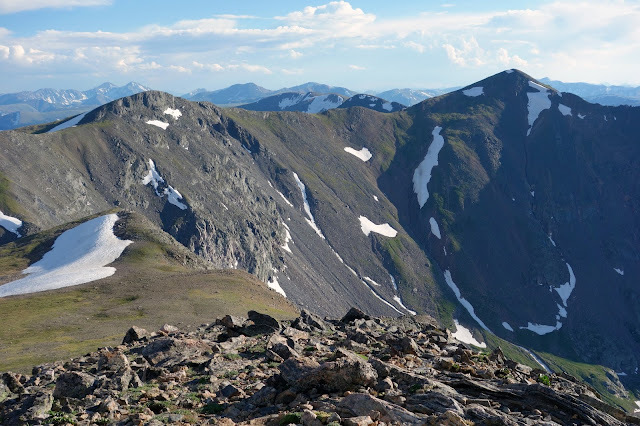 I'd love to do a thru-hike, especially the CDT someday. Like when Clara is an adult or old enough to go with me. I also want to hike with Leslie but I'm worried she's going to be up here while I'm out of the country. Yay for thru hiking. I don't think I could keep up with Leslie, though the mileage looks doable. And I used to bring a stove too until I realized it was hard to find the time to cook. The storms look too sketch for me though. "Monkey Bars"
Wow! Stunning hike! 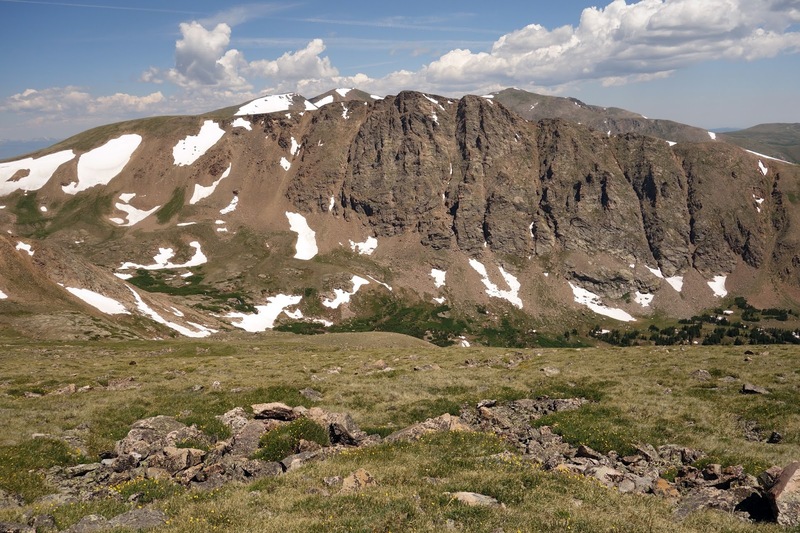 I always thought if I did a through hike I would do the CDT. But, alas, with my knees, it's not in the cards. Just fantastic that you were able to spend this time hiking with Leslie, especially with no major issues. I have been following her progress on Facebook, but this post has given a wonderful insight into her daily routine. You sound intrigued. Is a thru-hike in your future? There may be a thru-hike in my future. 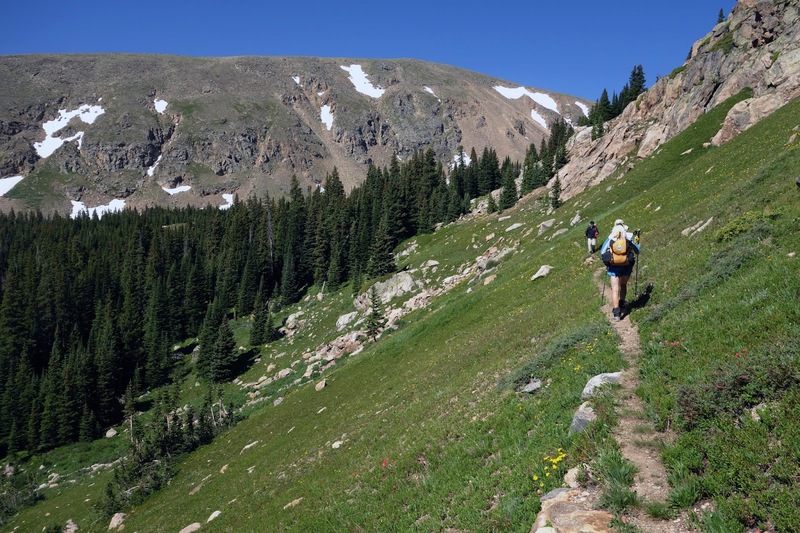 A shorter one like the Colorado Trail is more likely than a months-long one like the CDT. I do love walking but that's really a lot of walking. Bike touring offers more variation in motion, and it generally allows one to move more quickly through the bad parts. I'm lightly disturbed by the notion of spending a week hauling water across the Great Divide Basin. It sure is an accomplishment, though, finishing something like the CDT. It makes the Tour Divide look like a sprint in comparison. Spectacular journal of your part of the hike. I love the high country but cannot do the altitude anymore so it's incredible when I get to get a glimpse of it through your writings and photos! Thanks for sharing this! I'm glad you got a taste of thru-hiking the CDT. I keep thinking that a thru-hike should be your next adventure, even with (or because of) your health issues. 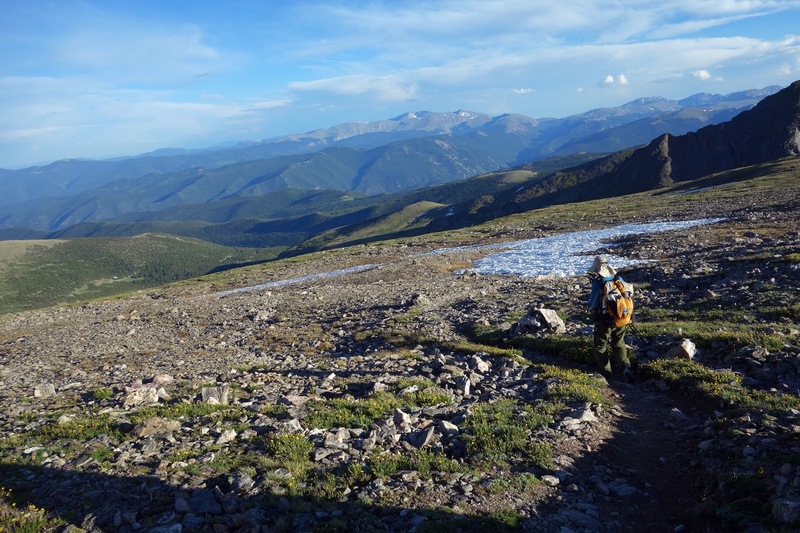 The thru-hikers motto of "hike your own hike" may be a better fit than a more rigidly-defined race. 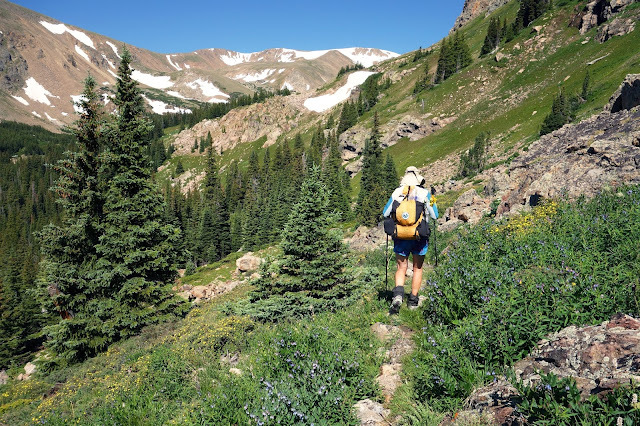 Btw, some thru-hikers do choose their own trail names, and many tweak the names considerably even after accepting one, or wear one and than get another that fits better. Hyoh, again--thru-hikers are kind of irreverent, even with their own traditions. I suspect you might want to experiment with the altered identity and perspective that a thru-hike brings though. The trail name is just a fun little signifier of all that. 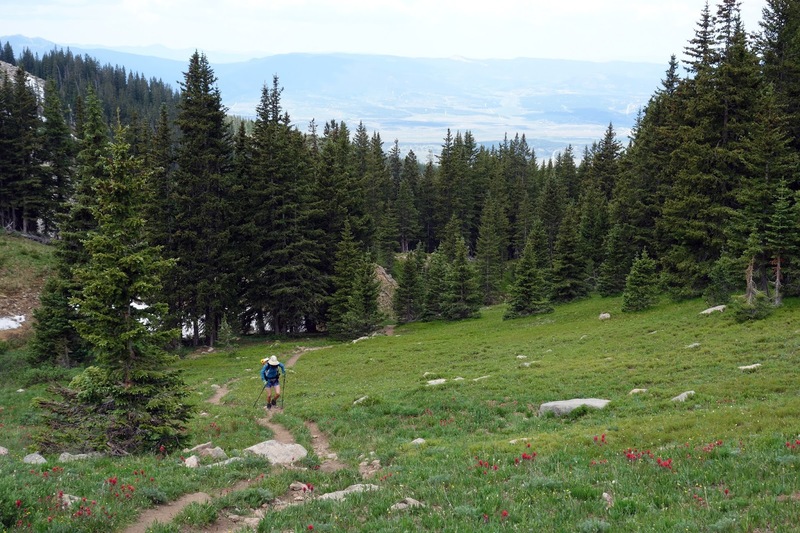 Nice write-up, makes me lonesome for the millionth time for the long trail. Never stop missing it. Reading this was a blast from the past - I loved reading Leslie's blog and can't remember if I found your's through her's or vice versa. Anyway, after I read your post, I scampered off into the interwebz to see if Leslie had rekindled her blog. Sadly not, but glad to still see she's rocking the adventures! You are both inspiring to me!! I've met a number of my friends via blogs, and most of them don't write anymore ... a sad development for me. Leslie is most definitely still rocking the adventures. 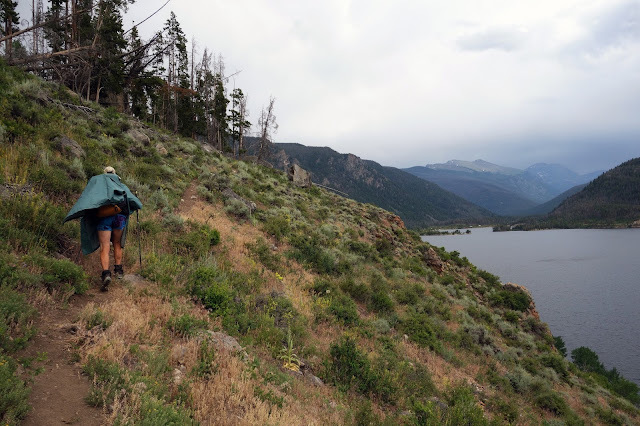 She's just finishing up with Colorado now, more than halfway done with the CDT.